A few weeks ago, I visited a local historic home with my aunt, uncle, and cousins. Something I saw there sparked a little research and has resulted in this post : ). 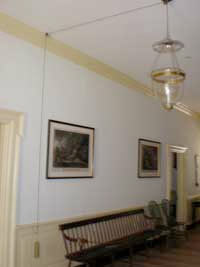 The chandelier hanging in the hall of the historic house was much too high to light easily using a ladder. But men had used the ingenuity God had given them to design a device whereby the chandelier’s candle COULD be easily lit—by just one person. The chandelier was hung using a long chain, at one end of which was a cylinder that perfectly balanced out the weight of the chandelier. Since the weight balanced, the chandelier didn’t move unless a person pulled or pushed on the chain. By pulling or pushing on the chain, a single person could easily higher or lower the chandelier, light it, and return it to its former position. As I looked at the chandelier, I realized this was math in action. Whether or not the original designers weighted the chandelier and the cylinder, I don’t know. But I do know that the weights equaled—and that math has been historically used to help design and use counterbalances for a variety of purposes. Merchants used to use a scale based on the counterbalance principle to weigh their products. On one side of the balance, they’d place the item to be weighed. They’d then add items of which the weight was known to the other side until the scale balanced. The whole process required quite a bit of math. If you’re working on measurement with your child, consider having him or her build a scale! Easy instructions can be found at the website below. As you build it, thank God for creating us capable of designing devices—like balances—to help us.